The novel Despite Stolen Dreams begins in Kashmir with the terrorism confronted by a family of noble people - Wali, though tried very hard, couldn't resist and he had to flee from his homeland and find a respite in Delhi. In Delhi, he is almost like a person from the earth on the Mars. Out and out an alien, he has to manage himself on many fronts. His son Salim advises him to change his clothing style and look more like a Delhi person and there, Wali thinks that it's not his robe but rather his identity is being robbed from him... with time and after finding a good friend like Kashmira Singh, Wali also settles in Delhi and his children are also settled well. Meher becomes a doctor and Salim is doing good. Abdul, who helped Wali in Kashmir, also finds something to do. The plot is clean but full of surprises which pull off awe from the readers on many occasions. Terror does come back in the novel but it comes in a variety of colours. Hashim, the leader of the terrorists, is a brutal and emotionless savage while there is someone like Shakeel who keeps transforming with the time and according to the situation. His love story with Shabnam is a refreshing tale which adds another angle to the whole terror theory. The end is very surprising and readers must read this novel to understand the meaning of real fiction versus the 'usual drab'. 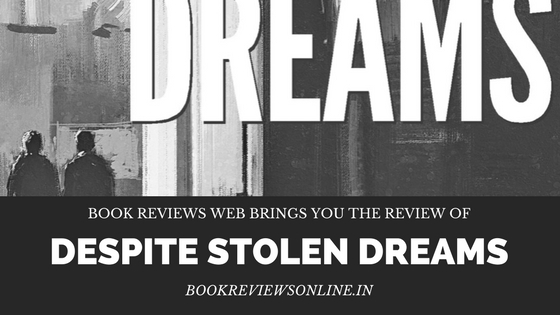 Language and storytelling technique of Anita Krishan have come up to new standards in her latest novel Despite Stolen Dreams. She has distanced herself from the over-dragged themes and has decided to write something serious and unique. Her novel does not add up to the same floated theories about terrorism and terrorists and terror mindset. She scans the background and presents a beautiful and vivid picture of the human psychology which requires a special enterprise and she offers it to her readers.